Sumptus – a daily expense tracker in your pocket. It’s an ultimate money saver tool designed to add expenses quickly and easily manage your budget. Sumptus allows you to control your budget, track monthly, weekly or daily expenses. Thanks to analytics tool you can easily see the most expensive spendings and optimize your budget. 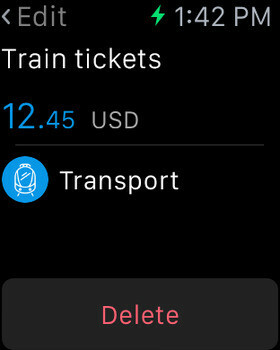 * DICTATE or type expenses right from your wrist. * Natural Language Input will recognize the expense and accurately create it for you. Enter your expense in one tap away. 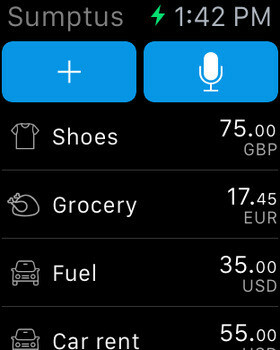 Simple launch the app and instantly start typing your expense note. When you're in a rush, you might only enter the amount you've spent. To save an expense just type it in a plain language “Coffee 5". Sumptus will recognise the expense and accurately create it for you. Create different budgets – one for home expenses, another for travel expenses and business trips. Add as many budgets as you need. 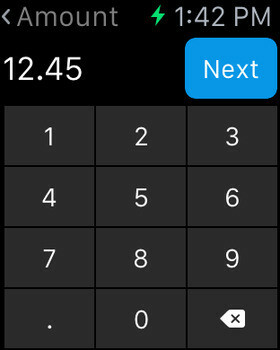 Use your iPhone as budget tracker. Take a glance at the expense pie-chart by categories. The diagram in pie-chart gives you an understanding what expenses can be cut down and helps you keep your budget in line. Money control helps create right budgeting. If you need to sum up a few expenses, simply use “+” while entering the expense: 25+45. Sumptus will sum your costs and save it as a single expense. 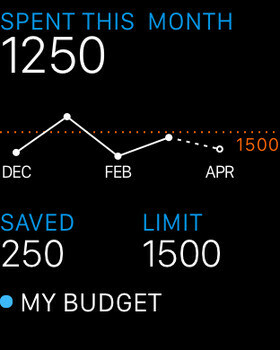 You can set limits for your monthly, or weekly expenses. This helps you easily track the amount of money left or saved. If you want to set a limit per category - it’s also possible. Limits encourage you to spend less and works as budget tracker tool. Use pre-defined categories. 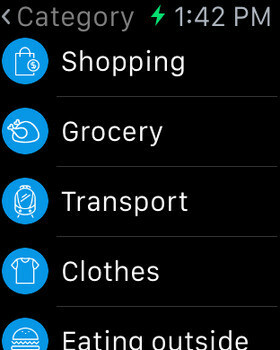 Once you feel that you need more categories create your own custom categories to personalise your list. View your expenses for a selected time period: day, week or month. You can also compare expenses during the previous months with the current one. Use calendar to enter backdated expenses.